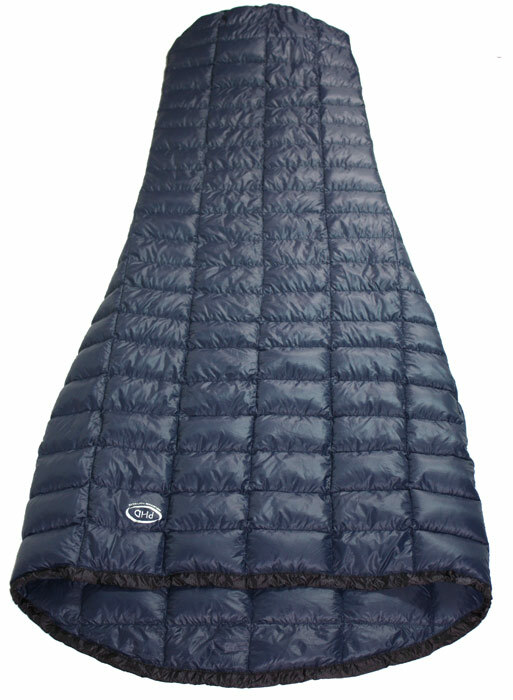 One bag that's stood out over the last two years has been the tiny K Filler sleeping bag. This is the lightest PHD bag ever for the minimalists. But it's called the Filler Bag because that's what it was primarily designed for, to fill the space inside your ordinary bag, providing significant extra warmth at the lowest possible weight. Our Minim Overbag and Hispar Overbag bags perform really well as overbags, adding their insulation on the outside. The beauty of the Filler concept is that it works from inside, softly expanding into the unused space and cutting out the convection currents. The result is a much lighter 'combi', less than a third the weight of our external Combis and a quarter of the bulk. Yes, it does. When the temperature's dipping too low for your Ultra K or Minimus bag, you'll find this little extra will shift the shivers. Of course it's not as warm as the external Combis, which will add about 20°C to the temperature rating of your bag. The Filler can add up to 10°C, putting it squarely in the frame for ultralight camping beyond the summer season. It's aimed at boosting lightweight bags, but of course it will work inside any bag anywhere. Yes, it's as wide as our standard ultralight bags, so there's no feeling of restriction, and it's so soft that it will naturally fill those empty spaces around you. And there certainly are spaces, even in slim-cut bags: few of us would accept the straight-jacket effect of a truly body-fitting bag. The Filler bag offers the best of both worlds: you keep the freedom to move and you get rid of those cold spaces at the same time. When it came to the materials to make the most of this design concept we had no choice, we had to use 1000 down and our new 10X fabric. The unique piece of kit we ended up with weighs just 240gm and goes into our size 0 stuff sac (10 x 18 cm). Just coming back to where we started, using the Filler as a single sleeping bag. It's shoulder length (closes at the neck), so you'll need some kind of head cover. And what you're wearing inside will make a big difference to the temperature rating. 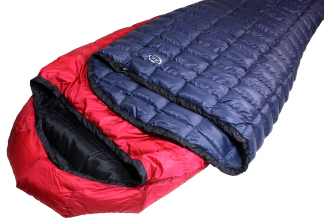 "One bag that's stood out over the last two years has been the tiny K Filler sleeping bag. I've used the bag a lot, both as a bag in its own right, both as a stand-alone bag but also as a 'sheet' style bag in hostels and grotty hotel beds (good for keeping the bed bugs out), as well as a liner bag in both down and synthetic bags. One way the K bag works so well is that it both insulates as well as reduces convection inside the bag, filling in the dead air space. Sleeping in the desert can often see you feeling very hot when the sun goes down but shivering at 3 am. And so I would often go to sleep with the bag around my knees and slowly pull it up as the night went on." "On a couple of occasions, faced with frigid temperatures, I've tried stuffing two sleeping bags together. Sadly, it's a fix that never works! The size mismatch always leads to compressed insulation and more cold spots than you can shake a stick at. PHD, with some neat design tricks, have cracked this problem and, in the process, come up with a highly flexible sleep system. 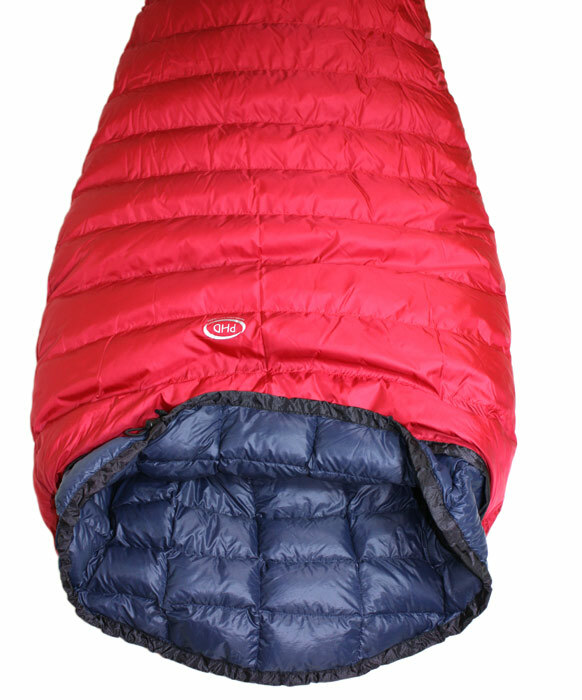 As well as allowing sleeping bag layering, the system also takes into account other down clothing. 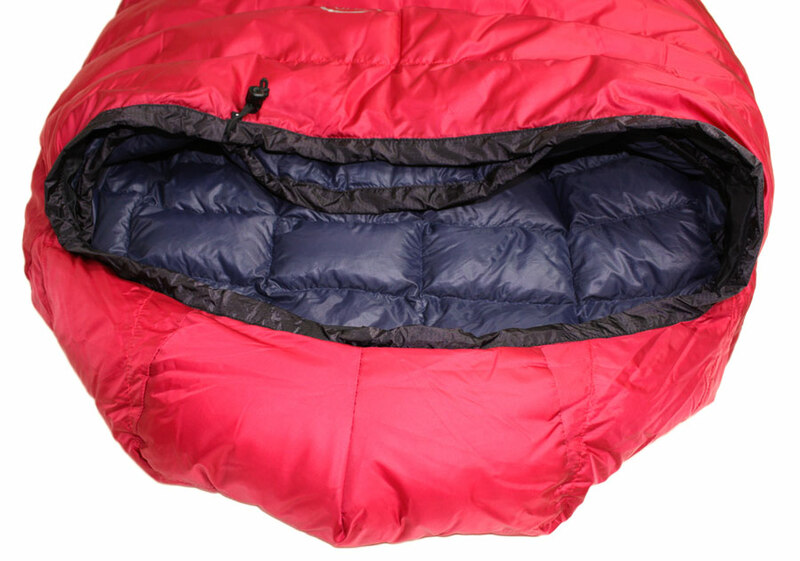 Basically, you have a main sleeping bag which is size-matched to an inner bag. 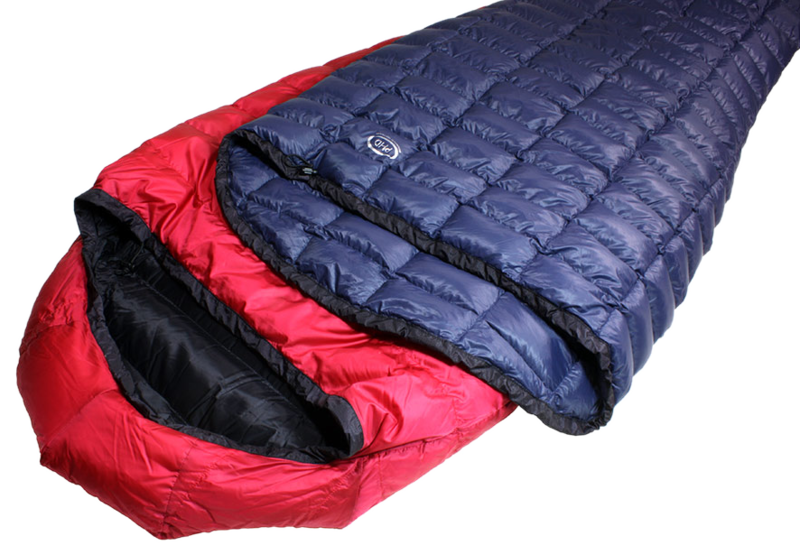 You can pick and choose for the main sleeping bag. This is then paired with an Filler Bag that can then either be used on its own as an uber-light summer bag (packs up not much bigger than my first), or can be paired with the main bag to boost the overall rating by a good 10 deg C. So, for me, the system works like this: paired bags for deep winter, solo main bag for the rest of the year, and then the inner for ultra-light trips at the height of summer. Verdict: An investment in flawless design that will last and last." 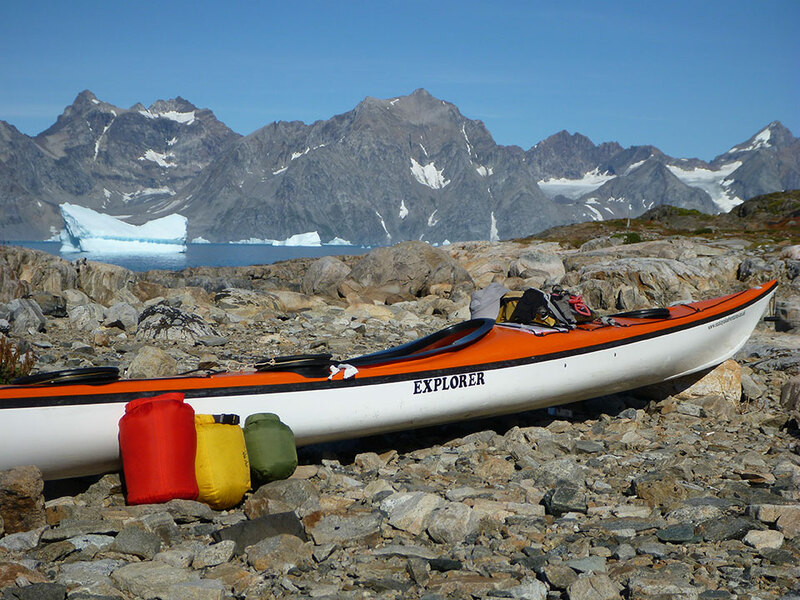 During recent sea kayak expeditions in Greenland, my PHD Minim Overbag, Minimus, and Filler bags were tested in temperatures ranging from just above freezing to as low as -10°C. It is a pleasure, when you know the temperature is dropping, just to slip into another bag and double the warmth factor"
"I used the Filler Bag in the Alps with great success. I happily slept in it, albeit with a vest and hat on, at temperatures down to around 12 degrees C and was perfectly comfortable. Saved a lot of pack weight. Thanks for a great product, the down you use is obviously of a very high quality." ""I 'bivvied' in the snow on the fell above my house. Inside a bivvy bag I was as 'snug as a bug' in the Minim Overbag and Filler. So much so that I slept until 8am. The temperature dropped to about -6°C." "PHD has reminded us once again why it is one of the world's best manufacturers of lightweight gear with the release of its super-light 240g Filler Bag. When used inside a sleeping bag, the Filler is designed to expand in the unused space and cut off convection currents to add 10C of warmth. It can be compressed into an impressively small size zero PHD stuff sac (10x18cm)."